The president of the Ghana Boxing Authority (GBA), Mr Peter Zwennes, believes WBO world super bantamweight champion, Isaac “Royal Storm” Dogboe, will reign supreme over Mexico’s Emanuel Navarrete when the Ghanaian makes his second title defence at the Madison Square Gardens on December 8. Mr Zwennes expressed confidence in Dogboe (20-0, 14 KOs) and stated that the 23-year-old undefeated champion would defend his WBO strap successfully and possible unify the division next year. Dogboe, who said he expected to fight a top three rated opponent on December 8, got his wish when American promotions firm Top Rank confirmed WBO’s number two contender, Navarrete, as his challenger on October 17. In an interview with the Daily Graphic, the GBA boss noted that the nation’s sole world champion kept improving by the day and was hopeful Dogboe would defeat Navarrete, unify his division and possibly move up to a higher excellence in boxing. “I am not bothered about anyone Isaac fights because I know his worth. What I can say is that he will continue to remain supreme and possibly go for his preferred unification. “He has become a popular world champion and if you see the reception he received after his victory over Otake, I am hopeful that he will go past his opponent in order to defend his title successfully and possibly move up to the higher excellence in boxing,” he said. Navarrete (25-1, 22 KOs) is considered one of the hardest punchers in the division with a 22 knockout victory in his 25 professional wins and will be hoping to make a statement for himself by beating Dogboe. The 23-year-old Mexican pugilist will be entering the ring on December 8, having knocked out his last eight opponents in Dennis Contreras, Salvador Hernandez Sanchez, Luis Bedolla Orozco, Jhon Gemino, Danny Flores, Glenn Porras, Breilor Teran and Jose Sanmartin. 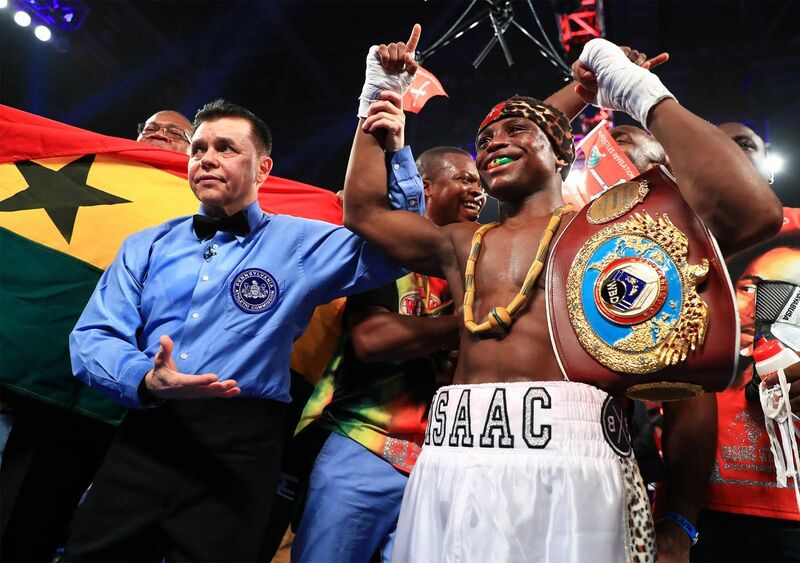 The fight with Dogboe would represent Navarrete’s maiden appearance at a world championship fight and the Mexican had expressed his desire to dethrone the 24-year-old Ghanaian to secure himself the world title in his first bid. “This is the opportunity I was waiting for,” Navarrete said in an interview with ESPN. “I have a lot of respect for Isaac Dogboe but this title will be mine”. “I feel very happy and motivated by this opportunity, even more because of fighting in New York City. I know that from December 8 forward, the name Emanuel Navarrete will be known all around the world. I’m sure this win will be mine,” he added.